Bliksrud, Norwegian Telecommu- nications Administration. "Seaplan: A Service to Mari- time Interests" by Louis M. It?" by C.H. Gray, communica- tions consultant. Board, John C. Fuechsel, Na- tional Ocean Industries Associ- ation; president, William T.
Conner, U.S. Power Squadrons, and general counsel, Leonard R.
Raish, Fletcher, Heald & Hil- dreth. Washington, D.C. 20006. The tel- ephone number is 296-6610. Longer service life with constant bearing clearances, and little or no weardown. Smooth operation with low coefficient of friction. Lower initial shafting costs—use carbon steel shafting—no journal liners or coatings required. Positive, reliable lip-type seals with over 20 years of proven performance—do not require controlled leakage. Simple, dependable lube systems need no special maintenance—maintain proper pressure and lubrica- tion, promote long seal life and virtually eliminate undetected leakage—inboard or outboard. Increased survey intervals—up to 6 years between surveys, tailshaft withdrawals may never be required. 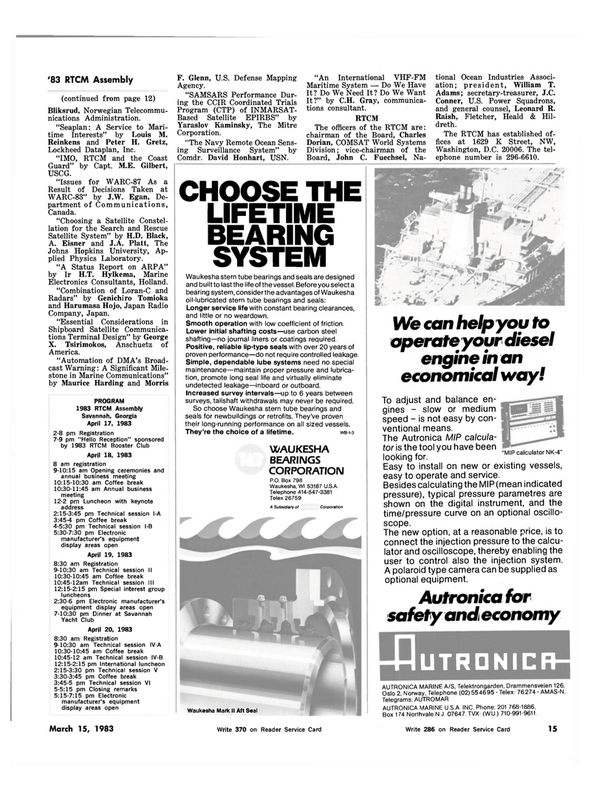 So choose Waukesha stern tube bearings and seals for newbuildings or retrofits. They've proven their long-running performance on all sized vessels. A Subsidiary of Corporation "MIP calculator NK-4"
We can help yoy to operate your diesel engine in an economical way! To adjust and balance en- gines - slow or medium speed - is not easy by con- ventional means. The Autronica MIP calcula- tor is the tool you have been looking for. Easy to install on new or existing vessels, easy to operate and service. Besides calculating the MIP (mean indicated pressure), typical pressure parametres are shown on the digital instrument, and the time/pressure curve on an optional oscillo- scope. The new option, at a reasonable price, is to connect the injection pressure to the calcu- lator and oscilloscope, thereby enabling the user to control also the injection system. A polaroid type camera can be supplied as optional equipment. Oslo 2, Norway, Telephone (02) 554695 - Telex: 76274 - AMAS-N. Box 174 Northvale N.J. 07647. TVX: (W.U.) 710-991-9611.